The Wizarding World of Harry Potter - Part One: Universal's Island of Adventure brings Hogwarts and Hogsmeade to life Tigger Travels - Family Adventure Journal Photos From Tigger`s Travels and MORE! For fans of the seven Harry Potter novels and eight movies from the mind of JK Rowling, the magical world is almost as real as everyday life. To have the opportunity to actually go there and walk the streets of Hogsmeade and wander through the corridors of the beloved Hogwarts would bring a new definition to the word "magical". 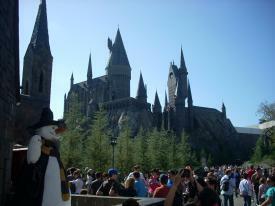 At Universal Studios Florida, the resorts in Orlando, such a place became a reality in 2010. Spanning 20 acres, this area of Island of Adventure drew in more than 7 million visitors in the first year alone, and with good reason. As you enter the park, turn to the right and follow the path through Seuss Landing and The Lost Continent to find the entrance to this section marked by the train that transports students to their School of Witchcraft and Wizardry for up to seven of their educational years. Even though the park is normally crowded year around, the hustle and bustle seems common place to anyone familiar with the scenes surrounding the train station. we could not imagine waiting in a line that takes over an hour to get through. Getting in the park at openning is the way to go! Even in November the lines got much longer as the day progressed. 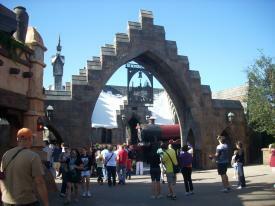 The Dragon Challenge is two rollercoasters intertwined into one huge ride. Near the platform, you have a choice of riding one side or the other. Some of the experienced riders we met in line said the Chinese Fireball (red left side) was an easier ride than the Hungarian Horntail (right), but both rate a 5 out of 5 on the excitement scale for everyone. The one stretch that sticks in my mind the most is about half way through the Hungarian Horntail where you fly straight up the castle wall. It makes you almost feel like you need to start pumping your feet incase the Hungarian Horntail needs a little help up the incline. The ride is thrilling, but the area you walk through to get there is interesting, too! As you walk, you pass through the tents where the champions selected their dragons and experience the whole Triwizard event. Even if you do not want to ride the dragons, walk through the line and be prepared to take plenty of pictures as you are transported to that fateful day. 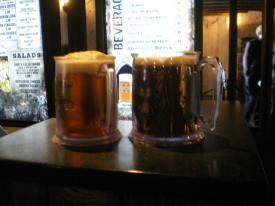 Another treat in Hogsmeade is the Butterbeer. 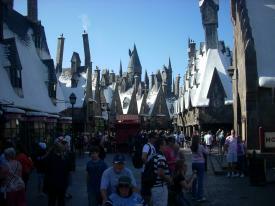 The day we were there, you could get it from a kiosk just beyond the Hogwarts Express. Again, getting there early, we did not wait a whole minute to order our drinks but two hours later the line stretched down the road. Before trying this delicacy, we theorized as to what it would taste like. From the description in the book, cream soda seemed the logical choice, but the added topping was the thing that set it apart. 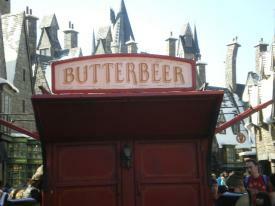 A little research in Google will reveal ingredients of whipping cream and butterscotch create a great head for your butterbeer. Being a lover of cream soda myself, this topping made it just that much better!